Grade 5 Scholarship 2017 and 2018 and G.C.E O/L 2017 and A/L Examinations 2017 and 2018 highflyers receiving their awards. People’s Bank recently held its Sisu Udana Vishitayo ceremony to reward all-island high achievers of Grade 5 Scholarship 2017 and 2018 and G.C.E O/L 2017 and A/L Examinations 2017 and 2018, at the BMICH, Colombo. The event witnessed the participation of People’s Bank CEO and General Manager N. Vasantha Kumar, Chief Executive Officer and General Manager Designate, Rasitha Gunawardena, Senior Deputy General Manager (Retail Banking) K.B. Rajapakse, Senior Deputy General Manager (Banking Operations),Bonniface Silva, Deputy General Manager (Retail Banking) Jayanthi Kurukulasooriya, Regional Managers of the Bank, parents of award recipients and principals of the respective schools. The keynote address at the event was delivered by Prof. Rangika U. Halwathura, Faculty of Engineering of the University of Moratuwa. The objective of Sisu Udana Vishitayo is to recognize the hard work put in by students to achieve top scores and to encourage them to aspire to greater heights. People’s Bank having minor Accounts inceptions and introduced Sisu Udana for students in 1994 with the objective of nurturing and strengthening a bright future for the next generation. The unique Children’s Account inculcates the exemplary habit of saving among school children between the ages of 5 and 18. In addition to the attractive interest rate offered and gifts, depending on the amount deposited, they are entitle the ‘Vishistayo’ rewards also as a CSR Project of the bank. If a child does not hold in account, the bank deposits the initial Rs.250/- to open the account on behalf of the child, so that they can start saving and enjoy the range of benefits on offer. Sisu Udana Savings Account can be opened at any People’s Bank branch island-wide. People’s Bank sponsors a series of seminars island-wide on annual basis, with the aim of improving the knowledge of students facing Grade 5 scholarship, GCE(O/L) and GCE(A.L). In addition, Sisu Udana has made special provision to withdraw the money deposited for special reasons such as for higher education and emergencies. 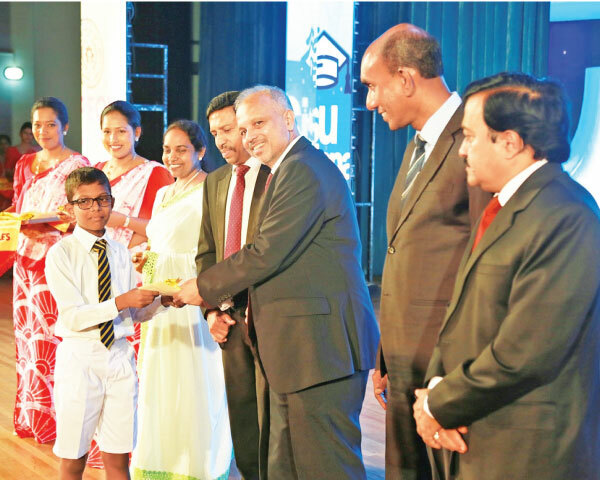 Forging ahead in its mission to digitally empower the nation, People’s Bank established Sri Lanka’s first-ever ‘School Banking Unit with CDM’ at several schools in a bid to extend banking facilities to students for enhanced convenience and safety, while inculcating the savings habit.